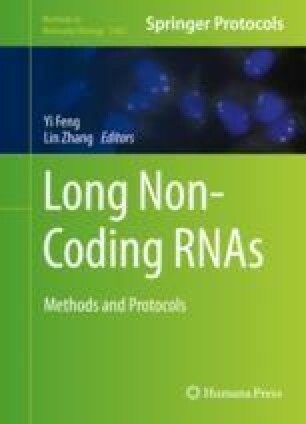 Long noncoding RNAs (lncRNAs) are noncoding transcripts usually longer than 200 nts that have recently emerged as one of the largest and significantly diverse RNA families. The biological role and functions of lncRNAs are still mostly uncharacterized. Their target-mimetic, sponge/decoy function on microRNAs was recently uncovered. miRNAs are a class of noncoding RNA species (~22 nts) that play a central role in posttranscriptional regulation of protein coding genes by mRNA cleavage, direct translational repression and/or mRNA destabilization. LncRNAs can act as miRNA sponges, reducing their regulatory effect on mRNAs. This function introduces an extra layer of complexity in the miRNA–target interaction network. This chapter focuses on the study of miRNA–lncRNA interactions with either in silico or experimentally supported analyses. The proposed methodologies can be appropriately adapted in order to become the backbone of advanced multistep functional miRNA analyses. The authors would like to thank Ioannis S Vlachos, Dimitra Karagkouni, and Georgios Georgakilas for their helpful comments and suggestions. This work has been supported from the project “TOM”, “ARISTEIA” Action of the “OPERATIONAL PROGRAMME EDUCATION AND LIFELONG LEARNING” and is cofunded by the European Social Fund (ESF) and National Resources.